This is one of my favourite DVDs for drilling, even though I'm not a tribal dancer! It's light on content - a 45 minute workout made up of a short yoga warmup and a sequence of belly dance drills - but in a way, that's what's so good about it. It's ideal for daily practice because there are no long introductions or explanations to slow you down. If you're short on time, there are two shortened versions of the routine (15 minutes and 30 minutes). To be honest, I don't use the whole yoga warmup. 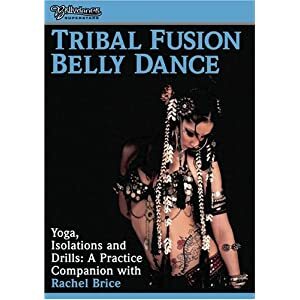 However, it's still the best DVD I've found so far, for the belly dance drills alone. I never get tired of the drills, which are slow and controlled so they feel almost like a meditation, while giving your muscles a real workout. There's also a final performance by Rachel which is excellent, although someone should have tied down the camera operator and forced him to film it straight, instead of chopping about.